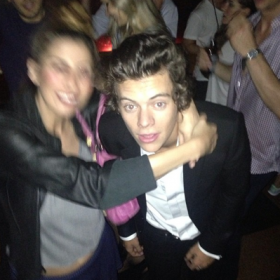 Well, Jay Z didn’t show up in Bushwick, but here’s something that actually did happen: Harry Styles of One Direction was “wilding on the dance floor” at Lit last night, according to DJ Prince Terrence, who posted this Instagram shot of the teen idol presumably celebrating his win at the MTV Music Video Awards the night before. “One Direction being at lit is blowing my mind,” Terrence tweeted, later joking(?) that Miley was on the way. Definitely not on the scene: Harry’s trash-talking ex, Taylor Swift. Unless this was a bizarre-o promotion for the upcoming One Direction doc, it looks like Erik Foss wasn’t kidding when he described Lit as “a place for creative people to come when they’ve just arrived to New York.” We’ve emailed him to find out how the Brit heartthrob ended up at the place (apparently fashion stylist Ian Bradley had something to do with it? ), and whether any shoes or tampons were thrown.